Naik Chain Singh was born on 19 October 1931 in BhainBangar village in Gurdaspur district of Punjab. 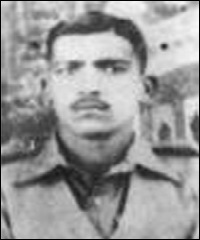 Son of Shri Sadhu Ram, Naik Chain Singh was enrolled in the Punjab Regiment on his birthday in 1951 at the age of exactly 20 years. During his initial years of service Naik Chain Singh served in various places with different terrain and operational conditions. By 1962 when the Indo-China war broke out Naik Chain Singh had already put in more than 10 years of service and evolved into a battle hardened and dedicated soldier. During the Indo-China war of 1962, Naik Chain Singh’s unit was deployed in erstwhile NEFA (North East Frontier Agency) the main battle ground for the war. Naik Chain Singh was commanding a section of the 9 Punjab in Tsangle area of NEFA. On 9 october 1962, his platoon was tasked to move from Tsangle to reinforce a vital position at Tsengjong, north of the Namkha Chu river. Later at night, one more platoon joined them to increase the strength of the position to 56 men. The troops had limited ammunition to fight with and hardly any time to prepare their defenses. On 10th morning 500 chinese, concentrated in the north and east of this post, started shelling it with guns and mortars. Naik Chain Singh and his comrades fought well, inflicting heavy causalities on the enemy and repulsed the attack. The enemy troops then launched a more determined assault on the post from all sides. Again Naik Chain Singh and his troops inflicted heavy causalities on them but then came the real crisis as they ran out of ammunition. Having assessed the situation the battle commander ordered the troops to withdraw. But it was not safe to withdraw as they were being targeted by the enemy troops without any break. In this situation Naik Chain Singh took over a light machine gun to give covering fire to the withdrawing troops. At this juncture a burst of the enemy machine gun injured him grievously. But he kept on manning the gun to enable his men to withdraw safely. However he could not continue long as another burst from the enemy gun hit him in the head killing him instantaneously. Naik Chain Singh was martyred but saved the lives of his comrades in a rare example of self sacrifice and conspicuous courage. Naik Chain Singh was awarded the second highest gallantry award of the nation, “Maha Vir Chakra” for his bravery, indomitable spirit and supreme sacrifice. Naik Chain Singh was in a platoon position at Tsengjong in NEFA in October 1962. Approximately 500 Chinese concentrated in the vicinity of this post and started shelling it with guns and mortars. Although greatly outnumbered and with a limited quantity of ammunition, Naik Chain Singh and his men inflicted heavy casualties on the enemy. The Chinese then launched a more determined assault on this post from all sides; but Naik Chain Singh and his men held on and inflicted heavy casualties on the enemy. When he had nearly run out of ammunition, he was ordered to withdraw his section. Ordering his rifle group to withdraw, he took over the light machine gun to give covering fire to the rest of his section but was hit by a burst of enemy machine gun fire. Although seriously wounded, he kept on manning the light machine gun to facilitate the withdrawal of his section. He was again hit by an enemy machine gun burst in the head and killed on the spot. It was due to the exceptional courage and leadership of Naik Chain Singh that his section could inflict heavy casualties on the attacking Chinese troops and withdraw. His supreme sacrifice was in the best traditions of Indian Army. My salute to you for the selfless service to the nation..Jai Hind…!